DROPPED ANOTHER $30K... MUST BE SOLD NOW!!! "Jennie" was designed by the famed Kasten Marine and is the epitome of proper steel yacht design. She is laid out and equipped for world voyaging on any ocean in any conditions. She is NOT a docksider with intracoastal ambitions! She IS available at 29% of her build cost and has exceptionally light use!! "Jennie" carries all the essential attributes of a WORLD CLASS YACHT... strength, safety, seakindlyness, performance, comfort, style and grace. 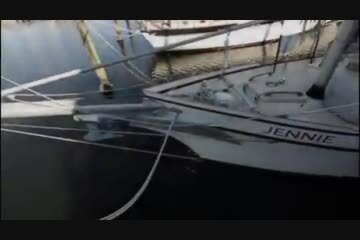 "Jennie" can easily be certified for CHARTER WORK and would be PERFECT for Resort "RUM CRUISES"
See "Additional Media" at the bottom of this page for further details! Jennie has a lovely and highly functional forward living area, galley area, nav station and two quarterberths making her the ultimate couple's bluewater cruiser (but she will sleep 4) ...with CLASS! Beginning forward below, the Fo'c's'l can be entered via a watertight access hatch in the exterior foredeck. The Fo'c's'l is used for anchor storage fed by spurling pipes directly from the foredeck windlass. Aft of the Fo'c's'l is the saloon, containing a settee berth to port and to starboard of a central folding table, allowing standing headroom between the settee berths. Aft of the galley to port is a large hanging locker/bureau. Aft of the galley to starboard is the head/shower compartment containing a vanity with sink, and a marine toilet. Inboard of the head is a companionway ladder leading up to the midship deck. To port of the companionway ladder is a door providing access to the engine room. Aft of the engine room is the Captain's cabin, accessed via a separate companionway and ladder directly from the aft deck. Facing the ladder there is a very large navigation area with extensive electronics and a large chart table. Single berths are located to both port and starboard of the navigation station. European beechwood woodwork throughout and large dry goods storage area below the cabin sole. The schooner rig is designed for efficiency whether on or off the wind, and to provide several well balanced and easily handled sail combinations. The masts are raked aft substantially, in order to keep the boom ends out of the water as the boat rolls at sea. The rake allows the foremast halyard to be positioned above the forward cabin top, and the main halyard above the aft cabin for ease of loading a skiff or other gear on deck. Masts are sleeved and jointed and are fully sealed water tight by welding at the top and bottom. The masts are keel stepped. The outer ends of the booms and gaffs are capped with weld-caps. Mast tops are tapered using facets of flat plate. The gooseneck fittings are fabricated out of aluminum plate, heavy wall aluminum tubing, and type 316 stainless rod. Goosenecks are welded to the masts and reefing gear has been fabricated out of aluminum and welded to the booms. The designer thought it best to make use of wire stops/grommets, soft eyes, rope stops, and other soft connections as opposed to fabricating complex hardware fittings that would be difficult to replace over the course of vessel maintenance. The bowsprit has been rigged with chain. The main mast is supported by a pair of shrouds on each side. The foremast is supported by a forestay as well as a pair of shrouds on either side. All standing rigging is comprised of galvanized stainless steel wire. Owners personal items not listed here are not a part of this sale. The company offers the details of this vessel in good faith but cannot guarantee or warrant the accuracy of this information nor warrant the condition of this vessel.While efforts are made to keep listing up to date, information provided at the time of listing is subject to change if the vessel is on the market for an extended time. A buyer should instruct his agents or his surveyors, to investigate such details as the buyers desires validated. This vessel is offered subject to prior sale, price change, or withdrawal without notice. Available for co-brokerage on a 50/50 basis. Brokers outside Florida contact office for details.